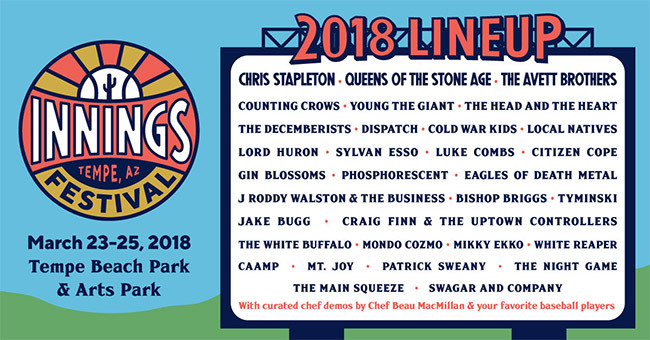 Chris Stapleton, Queens of the Stone Age and The Avett Brothers have been confirmed to headline the inaugural Innings Festival, set to take place March 23-25, 2018 at Tempe Beach Park & Arts Park in Tempe, AZ. The lineup also includes Counting Crows, Young the Giant, The Head and the Heart, The Decemberists, Dispatch, Cold War Kids, Local Natives, Lord Huron, Sylvan Esso, and many more. The three-day event will also feature culinary demos with Chef Beau MacMillan and professional baseball players, curated food vendors, and fun family activities. Three day General Admission tickets, three day VIP tickets and three day Platinum tickets will go on sale this Friday, Oct 27th at 10 am PT at inningsfestival.com. Innings Festival is the can’t-miss celebration for music lovers and passionate baseball fans including enthusiasts traveling from Chicago, Cincinnati, Cleveland, Denver, Kansas City, Los Angeles, Milwaukee, Oakland, San Diego, San Francisco, Seattle and Texas to watch their favorite teams at Spring Training in Arizona.